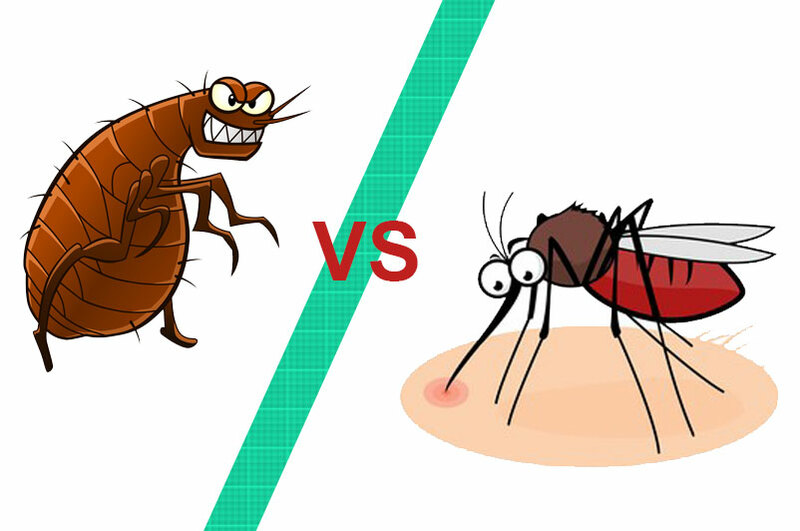 It is important for us to be able to differentiate between flea bites vs mosquito bites for us to take adequate steps to prevent such bites from occurring. Mosquito bites and flea bites have one common similarity, being that they are both itchy, irritating and annoying. Regular scratching often leads to further infection depending on your skin type. These infections are quite difficult to treat as some may necessitate the use of anti-histamines, hydrocortisone, and other antibacterial medications. There are different types of fleas, and some do not require pets to serve as their host, an example of such flea is the Human fleas (Pulex irritans), as such Flea bites could happen in a home where there are no pets. The most common species of fleas are the dog and cat fleas which tend to feast on humans when their main hosts are absent. Fleas can jump to an extreme height to be able to get to their host. – Flea bites naturally occur around the feet, legs and other areas of the body that are easily accessible. – Bites underneath the toenails, or the feet and in some extreme cases around the genitalia are usually signs of bite from sand fleas. Sand flea bites are usually painful and swollen. For individuals who are their immune system has been compromised, they stand a serious risk of getting skin infections. – For those who have allergies and also in little kids, sub-epidermal blisters could occur as a result of flea bites. These blisters might not be a direct result of the flea bites but mainly as an allergic reaction to the flea bite. – Rodents and rat fleas usually transmit fatal diseases like plague and murine typhus. – A typical flea bite occurs in the shape of papules or wheels. These bites are clearly identifiable from a central area where the flea has bitten to draw out blood. This spot is typically referred to as the purpura pullicosa. Mosquitoes are essentially carriers of several diseases. Male mosquitoes love to feed on plant products while their female counterparts need a blood meal to be able to reproduce (lay eggs). There different species of mosquitoes in existence. – Mosquito bites appear in every part of the body from your legs, arms, face, back, to other parts of your body. – The areas surrounding the mosquito bite is usually swollen and reddish. – Infected mosquito bites are typically accompanied with itching, redness and swelling. Bites look like small clusters of red spots. Bites look like mosquito bites. They are red, firm, and sometimes swollen. Bites are scattered about randomly, and are usually found on the legs, ankles, or feet. Bites often appear in linear rows, and can be found anywhere on the body. Bites may occur at night, but are more likely to occur when in close proximity to furniture or pets. Bites usually occur at night when you are sleeping in your bed (hence the name). Bites start to itch immediately and will become red within an hour of being bitten. Bites may take several days to appear, and begin to itch gradually.